We are very excitied to announce the launch of new online resources for Korean, Yaho! Hangugeo. We hope that you and your students enjoy exploring the resource and perhaps even create some more activities of your own to share with your colleagues. Click here or on the images below for direct link to Yaho Hangugeo. Click on the image or link below to download the Korean teaching and learning materials from King Sejong Institute. See the series of Korean textbook titled '세종한국어' develoed by Sejong Hakdang. Check the teaching and learning materials for Korean at the NIKL, Centre for Korean teaching and learning site. To see the page, click on the image or link below. The PPT file below would be useful (as a fun activity) when doing the Arirang Unit 5 It's Delicious! (맛있어요!). The list for Korean songs YouTube: not recently updated, but maybe useful. A series of four learning objects for students in the first 100 hours of Korean, related to the topics of family, food, sport and leisure.The learning objects are: Woori gajok sajin, Taekwondo haeyo, Saengil chukhahaeyo and Naeil meo hayeo? Each object is based around a flash scenario with a number of associated interactive activities. Many activities contain audio. Individual assets can be downloaded and integrated flexibly into existing teaching and learning programs. Laptop friendly resource. Dropbox link (limited time only) to download the full sets of the worksheets linked to 우리누리. The full package (Movie, Audio, Transcripts, Activities, Answers, & Teachers notes) can be downloaded from the Woori Noori website.This resources was developed and published in 2010. 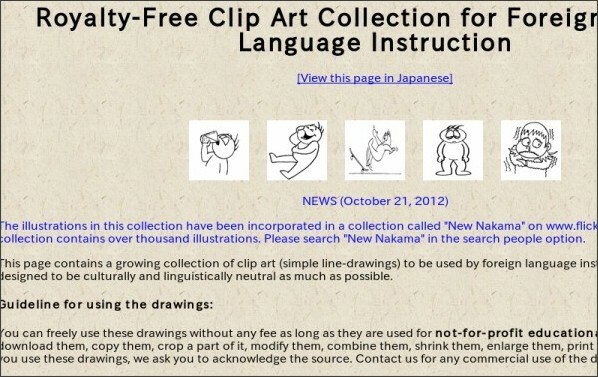 Follow the link below to download the royalty-free clip art collection for your language lessons. The video (MV) linked below is one of the resources from the IUE. Click on the image to visit the resource page. This resource was developed and published in 2001. It is out-dated, but still useful from the language aspects. I had only one copy left, so PDFed the final copy and uploaded it in the dropbox. Contents for the resource: Unit 1 Growing up, Unit 2 Animals, Unit 3 Plants, Unit 4 Living things, Unit 5 Living and non-living things. The Arirang Hangeul Unit, Unit 1, Unit 2 and Unit 3 have also been updated. New Arirang Units are Unit 4, Unit 5, and Unit 6. All Arirang course materials are available as PDF and Word formats.